This screen grab isn't news to anyone in Search. The search [SES London] gets its own little Universal Search with two video embeds. 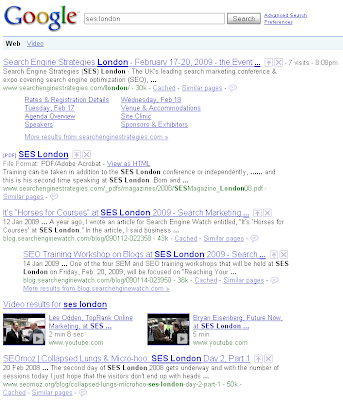 Needless to say that the Search Engine Strategies London page (not the SES homepage) gets its own site links too. 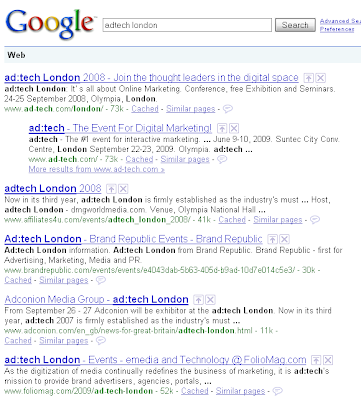 Firstly it tells me that in terms of search frequency and content creation - SES London is a significant event. Pick a few other marketing or digital conferences and see if they get the same treatment. Here's ad:tech London (which is a little unfair as it's not about to happen and so there's less buzz online). The next time you're asked for a practical example of how someone can benefit from Universal Search you can reply; "Go to a popular event and get yourself interviewed". All of a sudden we have a new metric for judging the worth of events - the propensity the event has to Universal Search you. There are also downsides; let's not forget the SES London where I was video interviewed on my way out, shattered, bedraggled and wired on too much diet cola! Ahem.